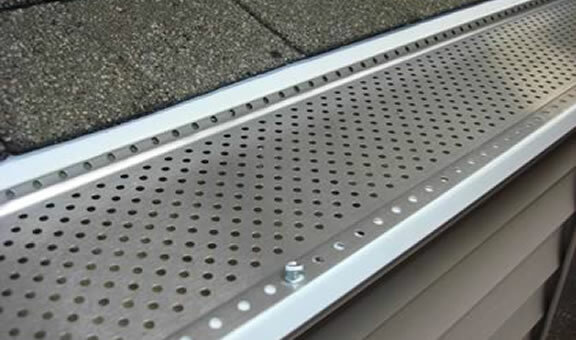 Gutters Screens or Gutter Guards help protect your gutters from getting clogged up with all the debris that you’d usually find in a gutter system on a home. Gutter Screens, usually made out of Aluminum or Stainless Steel sit on top of your gutters and basically act as a screen, only allowing the water and small debris to pass through. Why Get Gutter Screens on Your Home? [singlepic id=1 w=180 h=166 float=left]Protection – Gutter Guards are a fairly inexpensive way to add another layer of protection to your home. Gutter Screens protect your drains and downspouts from getting clogged up with leaves and other large debris. Maintenance – If you have to clean your gutters 2 or 3 times a year then you will appreciate the low maintenance with Gutter Screens installed on your home. The screens still need to be cleaned occasionally but not as often as un-screened gutters. New Gutter Screens – If you’re having brand new gutters installed then you might want to take a look at our Alu-Rex, T-Rex Gutter Hanging System. It’s the strongest hanging system available to stand up to our Kootenay winters and it also incorporates a gutter screen into the design for protection of your drains and downspouts. TRS Gutters builds and installs gutter screens on Kootenay homes and businesses. We’ve got extensive experience with roofing and gutter systems and you’ll know your project is in the hands of qualified craftsman.